First, nothing he said takes us directly to the extraterrestrial in the first interview. He said he was sworn to secrecy, but you could say that this is what is told to those in classified briefings about almost anything. Classified briefings frequently open with a warning that the contents are classified and disclosure to those not cleared can result in a prison term and hefty fine. Second, he said that he had promised the president that he wouldn’t talk about it. Does that mean he talked to Harry Truman personally, or did Truman send a representative to Roswell to learn what those officers knew and tell them that it wasn’t something they could talk about openly. I believe that Easley told the president’s representative that he wouldn’t talk about it. Third, that the president was involved moves us from the really mundane. In other words, it suggests that Mogul, for example, is not the answer. 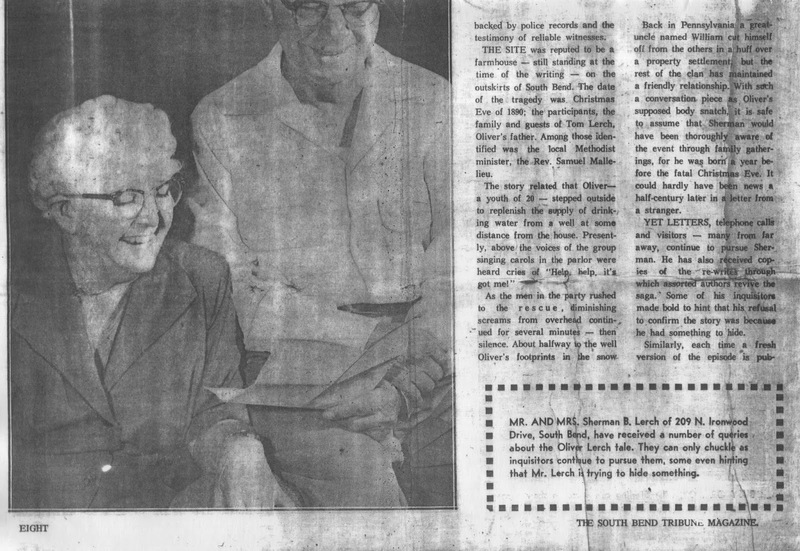 The balloon launches in Alamogordo were detailed in the newspaper on July 10, 1947. Clearly, the recovery of the remains of a balloon array wouldn’t have caught the president’s attention, and no one would care if anyone talked about it. True, the purpose was classified, but no one was talking about the purpose, only the activities in New Mexico. Fourth, is there a terrestrial explanation for this sort of response? In 1947, the size and shape of the atomic bomb was classified. If the 509th Bomb Group had dropped a mock up somewhere in the desert, that might have required some sort of higher level response. I’m not sure what the intelligence value would have been just by seeing the mock up and estimating the size, but it was classified. So, we have an explanation for the effort to conceal what had been found near Roswell that isn’t of alien manufacture. It is something that would have been concealed, though you would think that Jesse Marcel, Sr., would know what the bomb looked like, and would have known what it was, but that’s an argument for later. What else did Easley say during that conversation? Well, he said he was the provost marshal, or rather confirmed that he was. But, heck, I had that information from the Yearbook and the Unit History, and from some of those who served at Roswell in 1947. No great revelation there. Well, that does, sort of, suggest he had been out to the crash site, but doesn’t move us to the extraterrestrial. We all know that something fell in 1947, it’s the identification of it that has us somewhat confused. So, that sort of suggests that he wasn’t out to the crash site. However, as the provost marshal, he would have had the ultimate responsibility for the security at the crash site. He certainly could delegate it to another of his officers, but since it is his responsibility, he would have gone out at least once. Whatever happened, Easley going out or not, doesn’t take us to the extraterrestrial. He does suggest that we talk to the rancher, but doesn’t really remember the name. He suggests we talk to Breece, though he called him Freeze. We learned that Breece had died before any of us got deep into the investigation. In the end, the important point here is that he mentioned having been sworn to secrecy and that he promised the president, or the president’s representative that he wouldn’t talk about it. This merely suggests that something important had happened, but nothing that takes us to the extraterrestrial. would have made the meeting special. I asked if his MPs would have guarded the airplanes involved in transporting the debris, and he said they guarded all the airplanes, meaning all those assigned to the 509th. He did say that none of the MPs were on the flights to Wright Field. That didn’t mean much because they were never used as guards on the flights anyway. 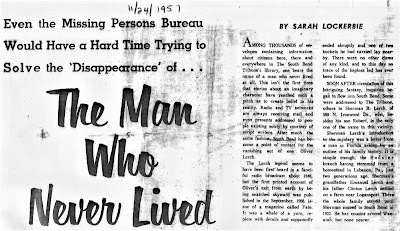 He told me that he hadn’t talked to anyone else about this, meaning, none of the people he knew in 1947 or any other investigators. That means that my interviews with him are unique. He confirmed, again, that he was in Roswell in July, 1947, but we’d already had the documentation to prove it. The conversation was fairly short, but friendly. I learned very little from it, though his reluctance to talk about it suggested something big had happened. It doesn’t mean that it was extraterrestrial, only that it was something that had been classified in 1947 (not necessarily meaning covered up). He knew that I was thinking of extraterrestrial, but he wasn’t giving me much in the way of information. But he did say that the entire 1395 MP Company had been transferred not long after everything ended. My impression here was that the transfer had been planned prior to July because the company wasn’t needed in Roswell. Easley had the 390th Air Service Squadron whose job it was to patrol the base, mount the guard, and the like. In other words, their duties mirrored those of the MP company. I then began to look through the Yearbook index that George Eberhart had prepared. We’re just chatting about the people he might have known and where they might have gone after leaving Roswell. I’m looking for people that Easley would have known such as the senior officers and NCOs and who might have been involved in the recovery. This suggested that the number of officers and men involved in the operation, whatever it might have been, was limited. You can mount a guard, create a perimeter around something but the men standing guard are far enough away, or the object is masked in some fashion, that they don’t know what it is all about. They just know that they had been given a guard assignment on that day. Again, an interesting little piece of information, but not one that takes us to the extraterrestrial. 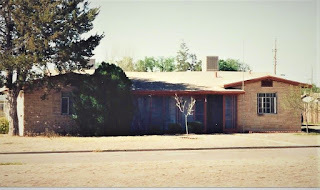 The next time that I talked to Easley was from the office of the Center for UFO Studies and was the last time. Since I was spending a couple of hundred dollars a month on telephone bills (back before cell phones and unlimited talk), the chance to follow up on some calls without having to pay for them was important. One of those I called was Edwin Easley. Since I didn’t have a recorder on the telephone, I took notes. Interestingly, one of the things he said was that he didn’t remember the MPs being transferred after the event, other than the whole 1395th. In the Unit History, there is a letter in which he mentions that there had been a high turnover in the 390th Air Service Squadron. They were being transferred in large numbers. I thought, based on the letter, it was a “train the trainers” type situation. In other words, these men were now trained in dealing with atomic weapons and security and since other units were now going to become part of the atomic strike force, more trained MPs were required. 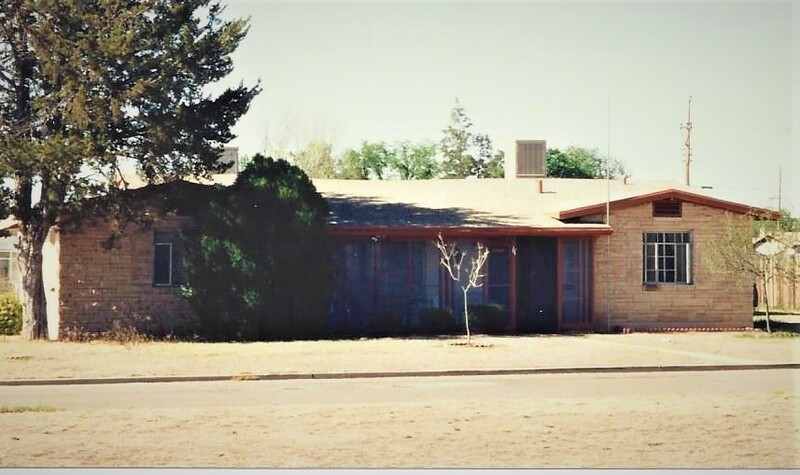 Those in Roswell were transferred so that they could train other MPs at other bases in the procedures related to atomic weapons. He also said that the material had been sent to Dayton, but then, there is the FBI document which made that suggestion back in 1947. This does not take us to the extraterrestrial. It merely means that the debris, whatever it might have been, was sent to Dayton and the Air Materiel Command for identification as far as he knew. 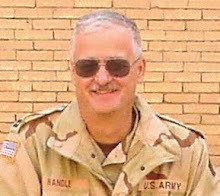 Easley said that this had been a verbal order from Colonel Blanchard, the 509th commander, which would be a little unusual, but not overwhelming so. Paperwork to cover the flight could be created later. The shipment to Dayton also fits in with some of what those who were working the balloon projects had said about the events in 1947. They had been asked to identify the debris that came from Roswell, according to them. It might have been from one of their balloon projects that was responsible. Easley said nothing about balloon projects. Easley also said that Brazel had been brought to the base for several days. Easley was not involved in the interrogation of him. He just said that Brazel had been held in the guest house, which is not as bad as being in jail, but if you’re not allowed to leave, it is sort of, the same thing. He also said that all the paperwork had been sent on to the Pentagon, though I confess, I’m not sure what all that paperwork might have been. Patrick Saunders, the base adjutant in 1947, did tell family members that they had been able to bury the paperwork on all of this. Neither of these points leads to the extraterrestrial. This is the one point in which we moved from the terrestrial to the alien. It is actually the only point in my interviews with Easley that anything like that had come up. Since I was the one talking with him, and I was listening carefully to him, there is little doubt about what he meant. But let’s look back on some of this. I’d made it a point to mention that I was a fellow military officer and that I had been a pilot in the Army and an intelligence officer in the Air Force. I told him that one of the things that I found funny was that when I went to Dayton, to Wright-Patterson AFB to meet General Exon, we had gone to lunch at the officer’s club. Exon had told me to park in one of the three spots reserved for general officers. I had built up a rapport with Easley. He was comfortable talking to me and I was careful to keep the conversation light. We had talked about keeping secrets, and at one point he asked me what I would do in his position. I told him, frankly, that I like to think I would have shared the information, but I told him that I probably wouldn’t. The oath took precedence over what feelings I might have about telling what I knew to those who wanted to know but had no authorization to know it. In those discussions with Easley, I got the impression he wanted to help as much as he could without violating what he thought of as his promise to the president. No, as I say, I don’t think he actually talked to Harry Truman, but to a representative of Truman, which is, sort of, the same thing. When I asked about following the right path and he mentioned that it wasn’t the wrong path, that was the closest that he came to giving away anything important. Again, in was in the context of a larger conversation that dealt with some of the trivia about Roswell. We had been talking about Brazel being on the base. I believe that he wanted to help as much as he could without violating the oath, which explains the wide-ranging conversations we had which only, occasionally, touched on important, relevant topics. This explains why I hadn’t made transcripts of these conversations. 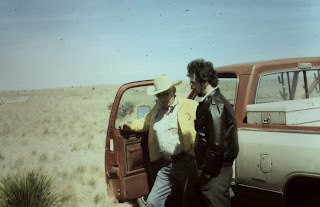 There are only one or two things that are relevant and the rest were just talks between two former Air Force officers… true, he retired in 1962 and I wasn’t commissioned into the Air Force until some thirteen or fourteen years later, but we did have the bond. I guess it was more of a link than a real bond. A couple of other things to come out of this. I asked him, at the beginning of each conversation, how he was doing. He always said, “Fine” or “Pretty good.” Can’t believe how those statements have become relevant in the world today. When all is said and done, there isn’t much here for any of us. Clearly, as we all know, something happened. There was an event that was classified. Some of the people at the base were involved and others were not. 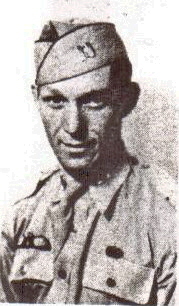 Easley, as one of the senior officers and the provost marshal, was one of those who were. He only said one thing to me that suggests that the event was extraterrestrial, and that was his round about comment that it was not the wrong path. Not really an admission of much of anything. If we wish to plug in the statement that comes from Dr. Granik, we have to remember it is, at best, second hand. At worse, it’s probably third hand. If he was not in the room when Easley said, “Oh, the creatures,” then he heard it from family members. He had a professional relationship with one of Easley’s daughters who worked in the same hospital as he did. And please don’t read anything into the comment about professional relationship. I mean that they knew each other, might have taken a lunch together, but had only that professional relationship. I know how the minds of those in the UFO community work… or in reality, disfunction. I will also note that I have been rejecting, in the last ten years or so, this type of second-hand testimony because it is, well, second hand. Doesn’t mean it is wrong or inaccurate, it just means that there is no way to verify the validity of it, we can’t ask the original source, and what they thought they heard might not have been what was actually said. The original source of those comments has been caught lying about all sorts of things. Add to it his confusion between the family of Curry Holden and Edwin Easley, we can reject all that he said about this. Especially when it is remembered that he never talked with Easley. That leaves back where we started, which is, there isn’t a lot here on which to hang a hat. A couple of comments that can be interpreted in a number of ways and one that suggests, indirectly, the extraterrestrial. In the great scheme of the world, I know that Easley’s one comment doesn’t carry much weight. To make it worse, it was the one time that I didn’t record the conversation. I planned to follow up on it, didn’t know that the time was running out, and tried to arrange things too late. He became ill not long after we talked. That’s where we are here. An interesting comment, heard only by me and no way to prove he said it. I have my notes, but that doesn’t really do us much good because, as we have seen way too often, notes can be whatever the writer wants them to be. Easley tells us something happened, some of the personnel on the base were involved, but he doesn’t give away very much. It proves he was an honorable man, trying to keep the secret but wanting to help me in my research. It doesn’t prove much of anything else, when you look at it dispassionately. So, we’re off on another great trek, searching for a treasure that is more myth than reality, worth more than the others we’ve all chased these last few years. Oak Island is truly a money pit, but only because of all the money they have been throwing into it. The Treasure of the Trinity has disappeared into oblivion. Last night (August 24, 2018) they had the opportunity to let us in on the secret there, but passed on it. While introducing the new crew of treasure hunters in the latest incarnation of Treasure Quest, we saw our old pal Jeremy Whalen from the first two seasons. They showed us the golden, Inca icon they found at the end of season two, but didn’t tell us a thing about it. For two years we have waited for something that would tell us a little more about it, and we have nothing… which means, it wasn’t exactly the huge deal they claimed it to be. room for two vehicles to pass. Drive off the edge and you drive into eternity. The fall is hundreds of feet. They, of course, safely meet up with the rest of the team, and have to make the rest of the journey using burros to carry their equipment as they walk along beside them. I’m wondering if they had ever heard of a helicopter because I can think of no reason that a helicopter couldn’t have carried everything and everyone in without having to face the peril of the Death Highway or the trek with the burros, which had its own dangers. But they can blow it up. No, they don’t have explosives, but they can make what they need from the material they carry. I’m a little worried about some of the stuff they have because, if you’re trekking in with burros, I’m not sure of the wisdom of carrying that extra weight, such as the propane tank. Seems like a waste of the limited carrying capability of the burros, when you consider the camera equipment, sound equipment, the digging equipment, and, of course, the food they’ll need not only for themselves but for the burros. But I digress. They are successful in getting through the block, finally reach the valley where the three rivers converge (and no, it’s not Pittsburgh), and are almost ready to begin. The burros refuse to cross the water, though I don’t really know why, so they carry the stuff across themselves and begin their preliminary search. They also are setting up their camp. They used all their matches making their explosive, but not to worry, they have a flint. One of them says that belly button lint makes a wonderful base for starting the fire. I have to wonder how you’d have enough belly button lint to be useful, but they spark the fire. Using a metal detector in what they suggested were the ruins of the Jesuit mission built centuries ago, they found a goblet that had been buried for a long time. This truly was an interesting artifact but it doesn’t really mean there is a massive treasure hidden there as they claimed. But we’re at the end of the hour, so we don’t learn much more about it. We have seen, in previews and teasers, them bringing in big machinery to help in the digging (which again, makes me wonder about the Death Highway and the burros) and poking a hole in the top of a tunnel or cavern. We see them coming to a wall in the tunnel that is clearly artificial. There are hints of coins being found and some sort of an underground lake. Along with the goblet, these are intriguing finds that hint at something bigger. 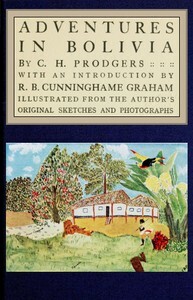 But then, when you read Prodgers’s book about Bolivia and this treasure, you learn that he broke into a tunnel, or tunnels, on several occasions, but he never found a treasure. That this new group has found a tunnel isn’t all that surprising, given the history of the area, but it is interesting. These might be tunnels that haven’t been explored for hundreds of years. Clearly, there is something in them, given the coins they will find in future episodes… but then, a few coins do not make a two billion dollar treasure. At the end of the second season of Treasure Quest, we were treated to a find that was an Inca sun god icon and a bunch of little llamas that might have been made of silver. All those items suggested western South America and Peru. This was proof that they had found the Treasure of the Trinity. They were jumping around yelling because their quest had been successful. We were told at the time that they were going to get their various licenses and permits renewed to finish the job. an idea of the general look. the new season of Treasure Quest where the “team” is searching for a new treasure. But we were also treated to a recap of season two that included the finding of that “gold” mask icon, the llamas and the jumping around. But we were told of anything beyond that. What can we make of that? Since it has been two years, and since we’ve heard nothing about the recovery of a major treasure, and they said nothing like that at the end of the recap, it means they found nothing important beyond what was displayed at the end of season two. 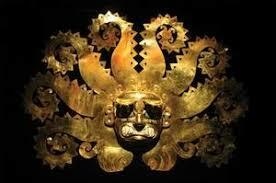 If I was a cynical person, I would believe that the gold Inca sun god icon wasn’t really gold. After all, one of the treasure hunters said that gold was the only metal that didn’t corrode. He said that it looked as if it had been planted the day before so it must be gold. And, I’m thinking, maybe it was planted the day before. This wouldn’t be the first “reality” show in which the producers added a little bit of excitement to boost interest, excitement and ratings. Now, I’m not saying that happened. I’m just wondering about it because, it did seem as if they had found something really important and valuable. For the last couple of years, I have been prowling the Internet looking for any hint that they had found the Treasure of the Trinity. There has been nothing. Not even that they had sold their gold artifact for hundreds of thousands of dollars, which they had suggested might be the value of it. My conclusion is that they didn’t find anything more. Had their artifact been that valuable, it could have paid for another expedition, especially with their success. Since that didn’t happen, and the new season’s only connection to the last two is that it is called Treasure Quest (and the one guy from the other seasons on this new one), it is clear they didn’t find the big treasure. was issued and it claimed they had “captured” a flying saucer in the Roswell region. The definition of flying saucer confuses the issue, because in 1947, there was no universally accepted definition. It could mean almost anything you wanted it to mean. But here’s the deal. It is vague to the point of being opaque. We don’t know what it means. Bill Brazel and Don Schmitt on the debris field. 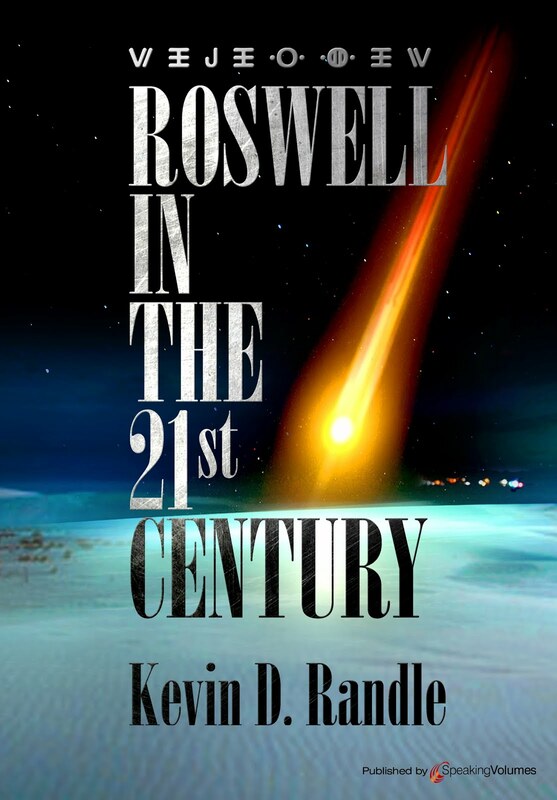 Over the last several days I have received a number of comments, privately, about my post, “The Decline of Roswell.” What is disturbing about it is that many people missed the most important part. 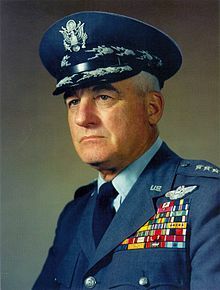 They focused on the statement by Colonel Howard McCoy to The Science Advisory Board about his wishing one would crash. But, that is not the critical comment. debris from earlier investigations. His mission was the investigation of sightings reported to the Air Force, and the gathering of what might be considered essential items of intelligence. He could do his job without being told that debris had been recovered from a crash. His statement isn’t particularly troubling, given the circumstances and his position in the UFO investigations. There was another document, a top-secret report entitled Air Intelligence Report No. 100-203-79 and dated December 10, 1948, with a second version dated April 28, 1949. The officers responsible for it make no mention of crash recovered debris. But the officers involved suggested there could have been some project or information that would have explained everything about the flying saucers if a free flow existed. In other words, this report doesn’t exclude Roswell, given that the officers didn’t have access to everything, as they themselves, noted. 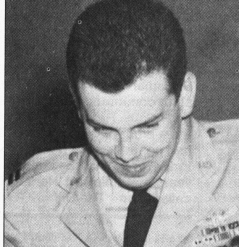 Lieutenant General Nathan Twining, in a letter he wrote on September 23, 1947, mentioned the lack of crash recovered debris. It might be important to know that the letter was probably written by McCoy for Twining’s signature. 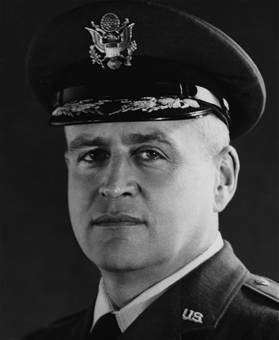 But the information used to form the opinion had been supplied by Lieutenant Colonel George Garrett through Brigadier General George Schulgen. The sightings and information supplied by Garrett contained no references to crash recovered material. Twining could accomplish his goal without referring to crash recovered debris and would have no motive for adding that information to his letter. The reference in the letter was about the lack of debris in the supporting documentation supplied, not actually saying that no such debris existed. It doesn’t close the Roswell door at all. Then there was the quote from the Science Advisory Board in which McCoy said that they wished one would crash. The problem is that the information in the briefing was classified only as secret and some of the participants might not have held top secret clearances. Besides, we run into that pesky “need to know.” In other words, this is not the fatal bullet to the Roswell case, given the circumstances. The possibility that the reported objects are vehicles from another planet has not been ignored. However, tangible evidence to support conclusions about such a possibility are completely lacking (I have highlighted this because of its importance). believe that he would have known about any recovered crash debris. He had been running the unofficial UFO investigation until the Arnold sighting in June, 1947, when it became more of an official study. He was on the inside from the very beginning, and he was a key member of Twining’s primary staff. The second real problem here is that McCoy would have no expectation that this letter would be seen by anyone other than those to which it was addressed and it was going to the top guy in the Air Force, especially since FOIA didn’t exist then. As I mentioned, he wouldn’t dare lie. If there had been a crash, he was writing to those who would know about it; more importantly these were the people who had to know about it because they would be directing policy. They might not have all the minutia of the crash or what had been learned by the reverse engineering, but they would know that there had been a crash of something that was highly unusual. They would know that this was a craft that had not been build on Earth. That leads us to the conclusion, based solely on the documentation from that time frame that the answer to the Roswell crash does not lie with the stars. There is, of course, always the possibility that there is missing information. And, we have to look at the testimony from those who seemed to have no reason to lie about this from Bill Brazel to Edwin Easley to Loretta Proctor and a dozen other low-ranking military men and to the civilians who lived in the area. I can say, without fear of contradiction, that something fell near Corona, New Mexico in July 1947. The question is still, “What was it?” The answer, today, is less clear than it was a decade ago. All I can say is that this one letter from McCoy worries me greatly and it should worry anyone else who believes that Roswell has an alien solution. As you all know, I like to chase footnotes. Sometimes that pans out and you read the results here. Sometimes it goes nowhere and there is no reason to publish it here. And sometimes someone will send me a note that launches a bit of a search that leads to a footnote chase that was initiated by someone else. That is the case here. I won’t keep you in suspense. According the information I received from the police department, their records did not go back any further than 1920. There had been a fire that destroyed earlier records, which would have included those about Oliver Lerch, regardless of the date of his disappearance, reported as either 1889 or 1890. 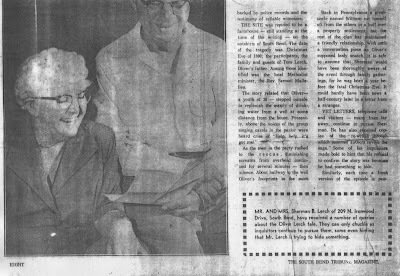 Article that appeared about the Lerch disappearance in which the relatives were interviewed about the story. 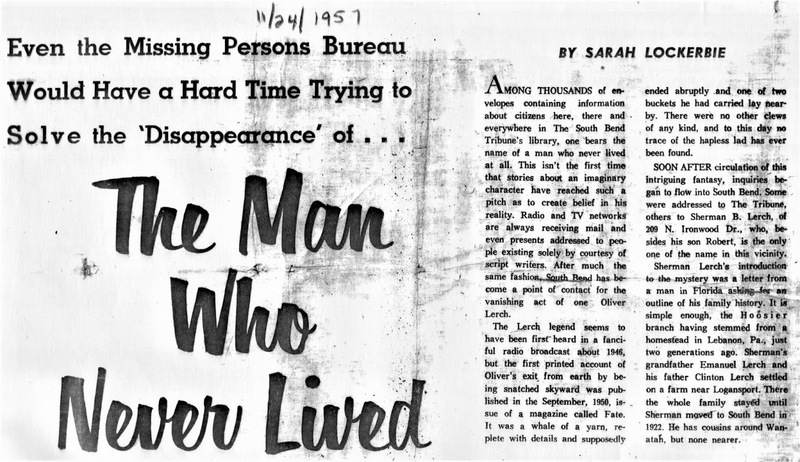 Written in 1957, it is clear that Sherman Lerch's father would have been around at the time of the disappeared. There is nothing in the article to suggest that there is any truth to the story. First page of the article printed here for the appropriate citation. Now, I’m going to assume that those of you really interested in this, have read my earlier blog post so that I don’t have to go into great detail here. I will note that according to the legend, Oliver, who was somewhere between 11 and 20, had been sent out to draw water from the well because his father was hosting a Christmas party (I always liked one of the sources telling us that throats were parched from singing but not telling us how he knew that). Anyway, somewhere between the door and the well, he was grabbed a bunch of useless speculation) had got him and his voice came from somewhere above the ground. Oliver was gone forever. 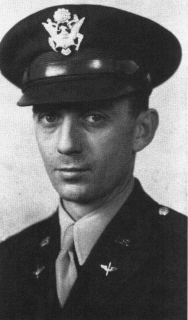 Paijmans and Aubeck tell us that one of those who wrote about the story in Fate in 1950, Joseph Rosenberger, said he had made it up for a quick buck. Jerry Clark said that he had information that the story was told to another writer in 1932 and, of course, we know about the 1906 version, so Rosenberger, who apparently plagiarized the tale thought it better to admit the hoax rather than admit the plagiarism. At any case, Rosenberger wasn’t the original source. Paijmans and Aubeck found that some rich guy in New Zealand thought so much of the tale, he would spend his entire fortune to finding what had happened to Oliver. This was in 1914 and he might not have found anything, saving him his fortune. Lewis’s story had stayed much the same after 50 years of retelling. What was different – and extremely important – however, was that Lewis included a sworn statement [ahh, those sworn statements from more than a hundred years ago… are any of them true? ]at the end of the story signed by ten people claiming to have witnessed the disappearance of Oliver Lerch. The authors [Paijmans and Aubeck] then looked into the identities of the witnesses listed in the 1904 article. To my extreme disappointment (because, come on, I know you, too, are holding your breath, hoping the sworn statement was legit [parenthetical statement in original], all of the witnesses were either completely made up, or (assuming census records revealed the existence of people by those names) could not have POSSIBILY been in the area at the time or known the Lurch [sic] family. The sworn statement was a giant load of hooey. This should drive the final stake through this tale. We’ve chased it to the end or rather Paijmans and Aubeck have chased it to the end. I found many flaws in the tale when I wrote about it on this blog years ago. Others have found other flaws in the reporting of it which suggests it was untrue. Just a tale invented for whatever reason. Now, Paijmans and Aubeck have found additional information which suggests that Ambrose Bierce had inspired the tale. In 1888, Bierce wrote an article that contained three stories of strange disappearances and the Lerch story was just one of them. The end of the trail, or in this case, tale, has been reached. Back in 1988, when Don Schmitt and I began our investigation into the Roswell case, there were no documents available, other than newspaper articles and a single report from the FBI. The newspaper reports were less than accurate with misspellings of names, and descriptions of the debris. The FBI document, which was based on an interview with Major Kirton (misspelled as Curtan in the FBI report) suggested that the object found was a weather balloon and a radar reflector. It also mentioned that this analysis was not verified by other sources. It is unclear in the report if the FBI called the 8th Air Force to find out what was happening or if Kirton had called the FBI to tell them about the recovery. Given the timing of the telex and breaking news, it is more likely that Kirton had called the FBI. That actually isn’t overly important here. I just thought I would mention it as an interesting observation. Neither the newspaper articles nor the FBI telex do anything to help us understand the Roswell case. There is too little information in them for any conclusive analysis. We are left with questions about the identity of the object found and both the telex and the newspapers can be used to support almost any explanation for Roswell. But that isn’t the whole story and here I will probably annoy my pals who accept Roswell as an alien spacecraft crash, and may even offend those who believe the answer can be found somewhere on Earth. Since Don and I began our work, other documents have surfaced and been brought into the discussion. 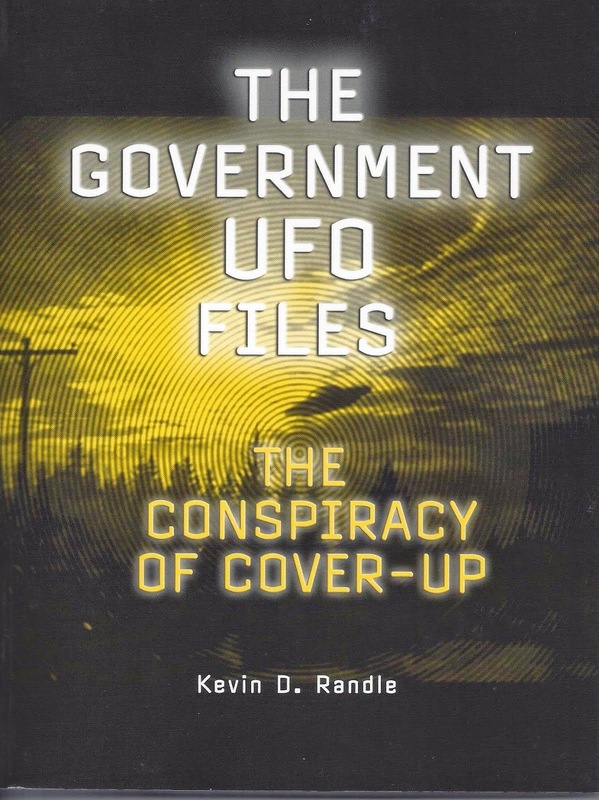 One the first, which was published in its entirety in The MUFON UFO Journal for July 1985, is a top-secret report entitled Air Intelligence Report No. 100-203-79 and dated December 10, 1948. There is another version of it, or rather the same report, but it is dated April 28, 1949. Neither version of this report makes mention of crash recovered debris, and in fact, says that the origin of the objects cannot be determined. The thinking is that the men responsible for the report, who had top security clearances, would have been able to learn about the Roswell crash had it happened. Since they make no reference to it, this is circumstantial evidence that there wasn’t a crash. There was a caveat in that report. The officers involved suggested that there needed to be better communication among the military branches to ensure a free flow of information. There could have been some project or information that would have explained everything about the flying saucers if such a free flow existed. In other words, this doesn’t exclude Roswell. 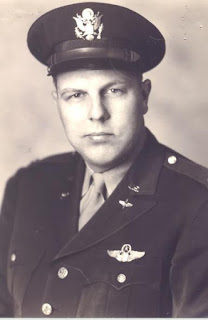 McCoy was the intelligence officer at Wright Field and the Air Materiel Command. He was Nathan Twining’s intelligence officer. If there had been a crash near Roswell, McCoy would have been involved in the study or reverse engineering of anything recovered. In fact, McCoy had been involved in the first of the investigations of unidentified aerial phenomena starting with the Foo Fighters in WW II. He was the guy who knew everything about them and was, you might say, Twining’s “go to guy.” If there had been a crash he would have known about it. There are those who say, me among them, that had Roswell involved the crash of an alien spacecraft, it would have been classified top secret. Given that, McCoy was restricted from mentioning this in a briefing that was only classified as secret and some of the participants in it might not have held the proper security clearances to hear top secrets. But I have always worried about that analysis. While he might not be able to discuss a crash in a conference that was only secret, I wondered why bring it up at all. If none of the participants was thinking in terms of a crash, he had just planted the idea in their minds. True, he had told them that nothing had been recovered and if you know something doesn’t exist, you are not inclined to look for it. Still this was not a good idea. He planted the seed. This wasn’t the only time that McCoy had brought up the possibility of crash debris. In a letter sent up the chain of command, to those who would have held the proper security clearances and who would have had the need to know. He expressed the same thought. Crash recovered debris would go a long way to answering questions about the identity of the flying saucers. The possibility that the reported objects are vehicles from another planet has not been ignored. However, tangible evidence to support conclusions about such a possibility are completely lacking. This becomes more worrisome. McCoy would have no expectation that this letter would be seen by anyone other than those to which it was addressed and it was going to the top guy in the Air Force. He wouldn’t be telling stories out of school and he wouldn’t dare lie. If there had been a crash, he was writing to those who would know about it; more importantly these were the people who had to know about it. They might not have all the specifics, but they would know that there had been a crash of something that was highly unusual. They would know that the craft had been built somewhere else, meaning not on Earth. McCoy would have no reason to lie to them about a crash because of who he was addressing in the letter. Here's where we stand on this. The documentation that does exist, that came from identified government sources, signed by the men involved who we are able to vet, suggest that they know nothing of crash recovered debris. Being who they were and what their jobs were, they would have known and the discussion would take a different track. For those believing Roswell involved the crash of an alien spacecraft, this has to be worrisome. It is arrayed against testimony that suggests otherwise. The problem is that it is just testimony and over the years much of that testimony has been found to be inaccurate. The longer we investigate the more of these testimonies have fallen by the wayside. There is some compelling testimonial evidence of a crash but there is this documentation that suggests otherwise. While that documentation might not completely close the door, it is certainly narrowing the possibility. As I say, for those of us who do attempt to look at all the evidence, this is quite worrisome.